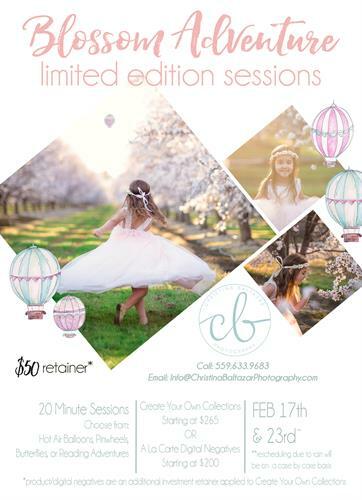 Limited Edition sessions in the beautiful almond blossoms of Central California during late February. These sessions are focused on the journey of baby’s first year, from the wonder of expectation in maternity sessions through the laughter of a cake smash! The story of adventure doesn’t end there of course. Adventure can be woven into each session as those babies grow into curious toddlers, candid kids and even high school seniors. The colorful watercolor elements are inspired by home decor trends while adding a sense of whimsy and playfulness that the kid in all of us will adore. dventure Awaits is all about playful and joyful interactions. Celebrating the fun and whimsical nature of childhood... releasing inhibitions and going with the moment. Our complete suite of props, flatlays, and other tools are all fueled by the joy and excitement the name evokes. $50 session retainer includes your 20 minute session in Lemoore, CA almond orchard for immediate family of up to 5 people. Your choice of theme - Hot Air Balloons, Butterflies, Reading Adventures, or Pinwheel Fun! Suggestions on what to wear as well as access to Christina's client closet for maternity, and baby sessions. Create your own collection, or purchase digital images starting at $200. Lemoore Orchard - specific location disclosed to booked clients only.